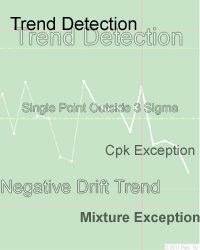 QC-CALC boasts an ever expanding list of trend analysis tools and actions that occur when a trend is detected. You can also optionally show the detected trend in the plot and change the number of points that define the trend. Features like this allow QC-CALC to tell you about a potential problem that may not be visible to the naked eye.